Before installation, check the software requirements, currently supported IBM WebSphere version and required Java version in the Software Requirements section. Download and install IBM WebSphere from the official download page. Note: During installation, make sure the IBM WebSphere profile name does not contain the keyword clover, otherwise the CloverDX Server won't start properly. You can set the limits in IBM WebSphere's Integrated Solutions Console (default URL: http://localhost:9060/ibm/console/). Change the value in the Maximum heap size field to 2048 MB. The default value (256 MB) is insufficient for ETL transformations. Go to Servers → Server Types → WebSphere application servers → [Server_Name] (default name: server1) → Java SDKs and select version 1.8 as the default SDK. Save the changes to configuration and restart the server so that they take effect. Go to the download section of your CloverDX account and download the clover.war (web archive) file containing CloverDX Server for WebSphere. Go to Applications → New Application → New Enterprise Application, select the CloverDX Server WAR archive and deploy it to the application server, but do not start it yet. Go to WebSphere Enterprise Applications → clover_war (or other name of the Clover application) → Manage Modules → CloverDX → Server-specific Application Settings and under Class loading mode select Classes loaded with local class loader first (parent last). Save the changes to the Server configuration and start the clover_war application. When uploading a large number of files in quick succession, the server may return HTTP Status Code 408 Request Timeout. To fix it, set the Maximum persistent requests per connection property to -1 (unlimited) in the WebSphere console. For more information, see WebSphere's HTTP transport channel settings. Some CloverDX features using third party libraries do not work properly on IBM WebSphere. Hadoop is guaranteed to run only on Oracle Java 1.6+, but Hadoop developers do make an effort to remove any Oracle/Sun-specific code. See Hadoop Java Versions on Hadoop Wiki. 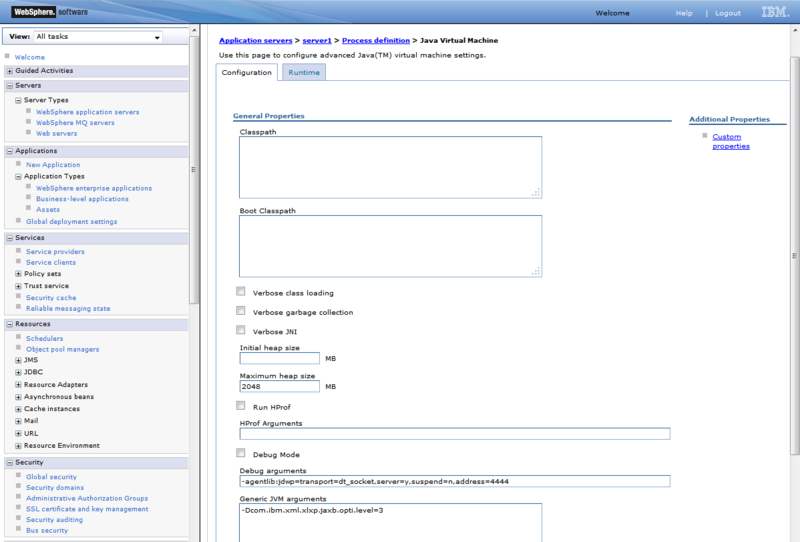 For easy configuration of CloverDX Server, use a Setup GUI in which you can configure various properties, including the connection to the database, username and password, path to the license file, private properties, clusters and much more (see Chapter 15, List of Configuration Properties and Chapter 42, Cluster Configuration). We recommend you place the file in a specified location and specify the path to the file with a system property. The properties file is loaded from a location which is specified by the environment/system property clover_config_file or clover.config.file. Set a system property (or environment variable) clover_config_file pointing to the properties file. Restart IBM WebSphere for changes to take effect.